For the average individual in the 1930s, times were dark and hard. But on the silver screen and between the pages of the latest dime store novels, times were dark and glamorous. Noir burst onto the scene with instant classics like The Thin Man and The Public Enemy, dark, confused plots complemented by one-liners and a new breed of femme fatale led by women like Jane Harlow. 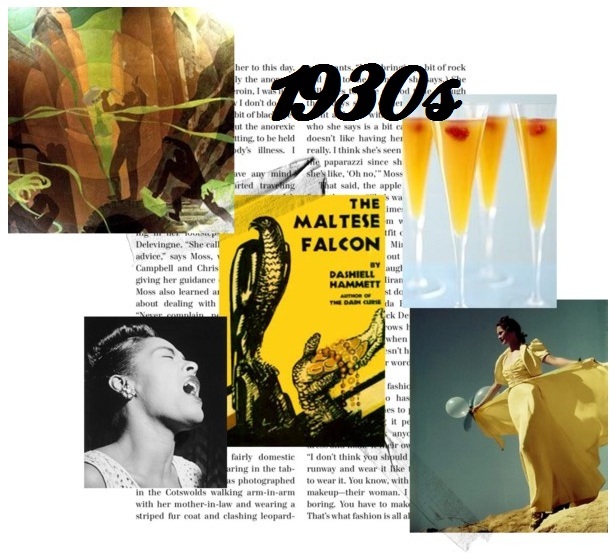 Literature, film and art became an escape into the glamorous world of champagne cocktails and floor-length evening gowns. Art deco-inspired paintings by artists like Aaron Douglas brought a modern, graphic edge to statements about social issues and kept with the jazz rhythms threading through every part of life. The Maltese Falcon, published in 1930, led the way for other noir novels, many of which became films later in the decade. Of course, much of the dark, twisted content of these books was censored by the Hays Code, leaving skeleton stories to be portrayed on screen though it did little to deter fans from flocking to theaters. Bellinis, elegant champagne cocktails, were one of the many drinks of choice in a post-Prohibition world and could be seen in the hands of Hollywood starlets like Mae West. Fashions returned to the natural waists and floor-lengths of before the Roaring Twenties but made the jump to bias-cut, making for flowing, tailored gowns that made every party seem like an elegant, masterful soiree. Jazz hit its stride with musicians such as Billie Holiday, her unique, instantly recognizable voice filling the scratchy radio waves along with Louis Armstrong, Count Basie and dozens of others.